Non-volcanic hot springs are generally believed to originate through circulation of meteoric or buried sea water heated at depth. In this study, we report the geochemical characteristics of the Arima and Takarazuka hot spring waters, known as Arima-type deep brine, in a forearc region of southwestern Japan. We examine 14 water samples to determine the levels of 12 solute elements or components and the isotopic ratios of H, He, C, O, and Sr, and we perform correlation analysis of the data to deduce the source materials and origin of the deep brine. Moreover, we perform numerical modeling of oxygen and hydrogen isotopic fractionation along subducting slabs to examine the composition of slab-derived fluid as a possible candidate of the deep brine. The results suggest that the high salinity and solute concentrations with characteristic oxygen, hydrogen, carbon, and strontium isotope compositions, as well as high 3He/4He ratios, can be explained by a dehydrated component of the subducted Philippine Sea slab. Hence, this study may provide an invaluable understanding of geofluid processes over a significant depth range. Various geophysical and geochemical studies suggest that within the mantle wedge and crust in subduction zones, fluid fluxes may trigger seismicity and magmatism throughout the system (e.g., Iwamori 2007; Hasegawa et al. 2008). The term 'fluid' in this case includes a variety of physical substances such as aqueous fluid, supercritical fluid, and melt (or magma), which are often referred to as 'geofluids.' Studies on geofluids may provide a clue to understanding the hydrological budget in subduction zones, as well as the global water and element cycling, since subduction zones are the major injection sites of water and chemical elements existing at the surface into the Earth's interior (Jarrard 2003; Fischer 2008; Iwamori and Albarède 2008; Shinohara 2013). With its distinct geochemical signatures, the Arima-type brine is known as a possible candidate of deep-seated geofluid. Despite its presence in non-volcanic regions in the forearc domain, in which Quaternary volcanoes do not appear (Figure 1), the oxygen and hydrogen isotope compositions have affinities to magmatic/metamorphic fluids; thus, the presence of a deep brine distinct from near-surface water, including meteoric water and seawater, has been long argued for the origin of Arima hot springs (e.g., Matsubaya et al. 1973; Tanaka et al. 1984; Masuda et al. 1985 and the references therein; overview presented in Sakai and Matsuhisa 1996). Although a precise definition of Arima-type brine has not been presented, non-volcanic hot springs with high chlorine (approximately 40,000 ppm) and other solute contents, as well as the distinct oxygen and hydrogen isotopic ratios, occur in the Osaka to Kii areas, southwestern Japan, along large fault zones (Matsubaya 1981; Nishimura 2000), where high 3He/4He of gases occur associated with spring waters (Nagao et al. 1981; Sano and Wakita 1985; Okada et al. 1994; Matsumoto et al. 2003; Umeda et al. 2006; Morikawa et al. 2008). Locality and tectonic setting of the Arima hot springs (small red circle), modified from Hirose et al. (2008). 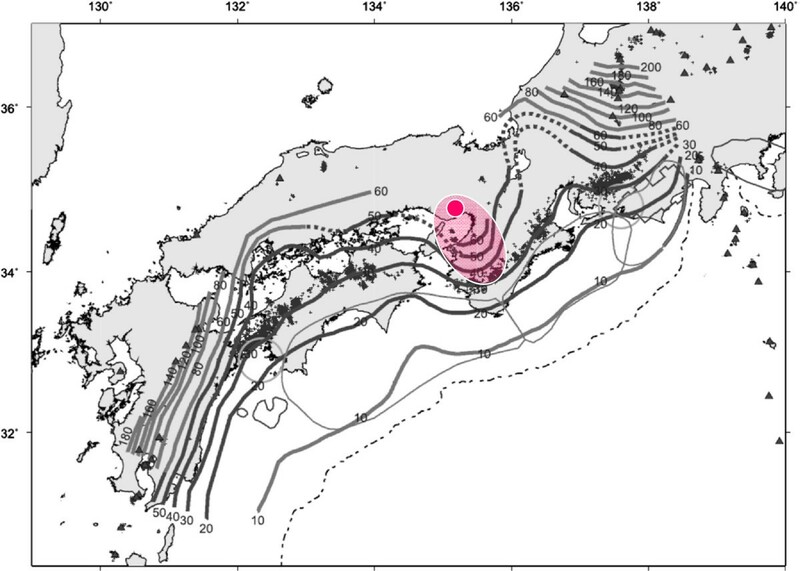 The pink area involving Arima shows the arbitrary boundary of the ‘Kinki Spot,’ where anomalously high 3He/4He ratios have been observed (Sano and Wakita 1985; Sano et al. 2009). Contour lines indicate the upper surface of the subducted Philippine Sea Plate, and the triangles denote Quaternary volcanoes. On the contrary, the nature and composition of such deep geofluids have been studied through high-pressure experiments on element partitioning (e.g., Brenan et al. 1995; Keppler 1996; Kogiso et al. 1997; Kessel et al. 2005), geochemical constraints on subducting materials and arc magmas (e.g., Ishikawa and Nakamura 1992; Plank and Langmuir 1998; Pearce et al. 2005; Nakamura et al. 2008; Kimura et al. 2009), and fluid inclusions in mantle-derived xenoliths (e.g., Schiano et al. 1995; Ishimaru and Arai 2008; Ionov 2010; Kawamoto et al. 2013), constraining elemental abundances and isotopic ratios of these geofluids. In this study, we discuss the relationship between Arima-type brine and deep geofluids in a definitive manner. In particular, we examine multiple element and isotopes of the hot spring waters, including the oxygen and hydrogen isotopic composition of the slab-derived fluid, and we determine whether the characteristic O-H isotopic compositions of the Arima-type brine are explained by the slab fluid. The samples and localities are listed in Table 1. In December 2007, water and gas samples were collected from hot mineral springs and artesian wells at 14 sites in the Arima area, located on the northern slope of the Rokko Mountains where basement rocks are composed mainly of Paleozoic to Mesozoic sedimentary rocks; upper Cretaceous to Paleogene volcanic rocks, including mostly rhyolites and andesites; and Cretaceous to Paleogene granitic rocks (Arai 2007). The Arima-Takatsuki Tectonic Line and the associated faults are distributed in the studied area, along which the Arima hot spring waters flow from the surface (Kozuki 1962). The studied area is within 600 m zonally and 900 m meridionally in Arima. In addition, two samples were obtained in Takarazuka, about 10 km east of Arima, where most of the springs flow naturally from shallow (40 m in depth) to deep (1500 m) reservoirs or flow paths along the faults (e.g., Kozuki 1962), with a temperature range of 19°C to 96°C (Table 1). In order to acquire a multi-element and multi-isotope dataset for each sample, the following measurements and analyses were performed for the sampled solutions and gases: (1) Temperature, pH, and electrical conductivity (EC; Table 2) of waters were conducted in situ at sampling sites. (2) Concentrations of cations and anions of water samples were determined with ion chromatography (DXi-500; Thermo Scientific Dionex, CA, USA). (3) Alkalinity, in reference to the concentration of total dissolved HCO3, was determined by titrating with H2SO4 up to a pH of 4.8. (4) Hydrogen and oxygen stable isotopes were measured by mass spectrometric analysis (Delta V advantage and Delta plus, Thermo-Fisher Scientific Inc., Bremen, Germany). H2 generated by the H2O-H2 reduction method by 800°C metal chromium was applied for δD analyses, and CO2 generated by the automated H2O-CO2 equilibration method was applied for δ18O analyses. (5) The stable carbon isotopic ratio (δ13C) of dissolved inorganic carbon (DIC), which was conventionally represented with respect to Vienna Pee Dee Belemnite (VPDB), was measured by continuous flow isotope-ratio mass spectrometry (IRMS) with a gas chromatography system (Delta-V Advantage and GasBench II, Thermo-Fisher Scientific Inc.). The detailed procedures have been described by Takahashi et al. (2013). (6) Helium and neon concentrations and the helium isotope ratios were measured with a noble gas mass spectrometer, model MM5400 (Micromass UK Ltd., Manchester, UK). Technical details of the extraction of dissolved noble gases and the mass spectrometry, including the purification procedures, have been described by Morikawa et al. (2008). (7) Sr concentrations were measured with an inductively coupled plasma mass spectrometer (ICPMS; ELAN DRC II, Perkin Elmer, Waltham, MA, USA) after dilution of the sample with HNO3 containing the indium internal standard. (8) Sr isotope ratios were determined with a thermal ionization mass spectrometer (TIMS; TRITON, Thermo Finnigan, Thermo-Fisher Scientific Co. Ltd., Hudson, NH, USA) after chemical separation of Sr using a 0.3-mL DCTA-pyridine cation-exchange column with a procedure modified after Birck (1986). Laboratory analyses (2) to (6) were performed at the Geological Survey of Japan, AIST; (7) and (8) were performed at the Japan Agency for Marine-Earth Science and Technology. nk, not known; na, not analyzed. The concentrations of noble gases are shown in [cm3 STP (noble gas)/g (sampled water)]. TG-1, AG-1, and AG-5 are the gas samples for which the He and Ne data shown in square brackets are available. The results are listed in Table 2. Both the solute concentrations and the isotopic ratios of hydrogen, helium, carbon, oxygen, and strontium exhibited wide variations. The chlorine concentration ranges from 14 to approximately 40,000 ppm (up to twice that of seawater), the lithium concentration ranges from 0.02 to 51.90 ppm (0.2 to 300 times that of seawater), and the air-normalized 3He/4He ratio ranges from 2.33 to 7.51 (close to that of the upper mantle represented by mid-ocean ridge basalt). In order to discuss origin of the brines that may potentially involve multiple source materials and processes, analyses based on multiple element/isotope data, as shown in Table 2, are useful for clarifying, for example, the association of elements/isotopes derived from individual sources. Such multiple element/isotope studies, including hydrocarbon species, on brine or gas from various tectonic settings such as subduction zones (e.g., Mutnovsky Volcano, Kamchatka; Zelenski et al. 2012), ocean islands (e.g., Socorro Island, Mexico; Taran et al. 2010), and continental-oceanic rifts (Salton Sea, USA; Mazzini et al. 2011) have been successfully used to identify various sources. These sources include altered basaltic oceanic crust (AOC), oceanic sediment, and continental and mantle sources, and their modification by chemical and thermal processes such as mixing, serpentinization, and near-surface cooling. The correlation matrix, in which correlation coefficients are arranged in a matrix consisting of individual elements/isotopes to be correlated to show the correlation coefficient at their intersection cell (Figure 2), shows an overall data structure. Many of the major solute elements/ions such as Cl, Na, Li, Br, Ca, Sr, NH4, and K have sharp positive correlations with δ18O and δD, resulting in a strong correlation with the electrical conductivity (EC indicated by asterisk in Figure 2). On the contrary, 3He/4He and SO4 are broadly and negatively correlated with δ18O, δD, and other solute elements, whereas 87Sr/86Sr, δ13C, HCO3, and F, as well as temperature and pH, are poorly correlated with the major solute elements. The sharp positive correlation among δ18O, δD, and the major solute elements is detailed below. 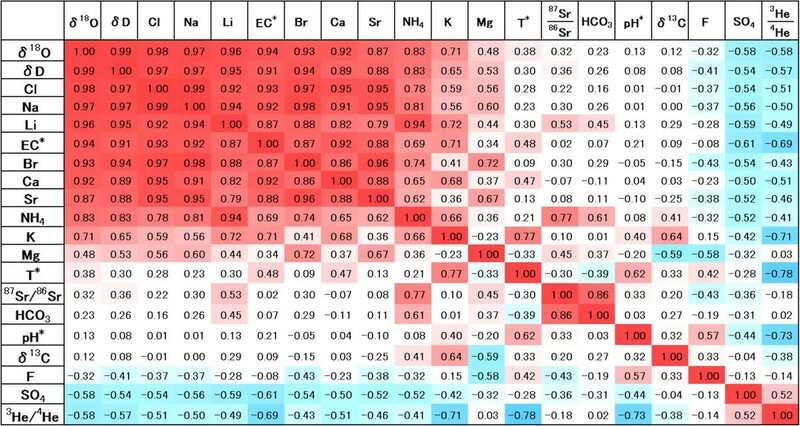 Correlation matrix among the major solute concentrations and physical–chemical properties. Color coding represents the correlation coefficient: large positive values (⪸0.5) are red, intermediate values (0.5 to -0.5) are white, and small values (⪷ - 0.5) are blue. EC*, electrical conductivity; T*, temperature; pH*, hydrogen ion exponent. Figure 3 presents the δ18O-δD diagram, in which the data form a linear trend toward a magmatic water composition distinct from the meteoric water line or seawater. Figure 4 presents the selected major element and δD diagrams, again showing linear trends of least squares regression with high coefficients of determination (R2 = 0.84 to 0.99). In Figure 3 and in the bottom two subpanels of Figure 4, each data point is labeled with the (abbreviated) sample number as in Tables 1 and 2, indicating a consistent sample array from AW-2, which is closer to or almost on the meteoric water line, to AW-11, which is closer to magmatic water. It should be noted that the same symbols are used in Figures 2 and 3; light blue diamonds represent the samples from Arima, and dark blue diamonds represent the samples from Takarazuka. δ 18 O versus δD diagram of the Arima hot spring waters and the predicted δ 18 O-δD evolution lines of slab-derived fluids. Red and green lines represent the evolution lines as a function of depth for the Philippine Sea slab (beneath southwestern Japan) and the Pacific slab (beneath northeastern Japan), respectively. The solid circles along the evolution lines indicate depth with intervals of 10 km. Red open star represents δ18O and δD of seawater, which is defined as 0‰ standard mean ocean water (SMOW). Blue open star at δ18O and δD ~ (+8,-40) represents the initial values of altered oceanic crust (AOC) just before subduction (Muehlenbachs 1986; Kawahata et al. 1987). Solid black line in the negative δ18O field represents the average meteoric water line in Japan (Masuda et al.1985). Large purple circle labeled ‘Magmatic water’ represents the reported range of the worldwide δ18O and δD of magmatic fluids, fumarolic gases, and andesitic waters after White (1957), Matsuo et al. (1974), Sakai and Matsubaya (1977), Mizutani (1978), and Giggenbach (1992). Variation diagrams for chlorine versus major elements and δD for Arima hot spring waters. The least squares fitting line expressed by the equation in each subpanel is shown with the coefficient of determination (R2). 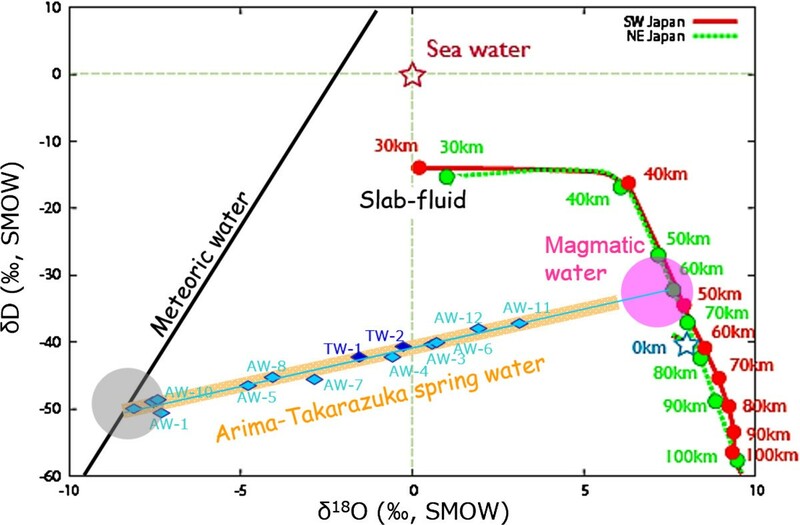 The new dataset and the linear trends confirm the previous results, which suggest mixing of local meteoric water in the Arima area (δD approximately -50‰ with nearly zero for all the solute concentrations, Masuda et al. 1985) and a deep-seated brine (e.g., Matsubaya et al. 1973; Tanaka et al. 1984; Masuda et al. 1985). Based on the new data, we quantitatively estimated the deep brine composition. The previously observed relationship between 3H and δD of the Arima hot spring waters, δD of the tritium-free water, i.e., a pure deep brine, is inferred to be -30‰ to -35‰ (Tanaka et al. 1984). Then, the least squares regression lines at δD = -30‰ to -35‰ provide the estimate on the brine composition: Cl- = 42,000 mg/L, Na+ = 21,000 mg/L, Li+ = 55 mg/L, Br- = 84 mg/L, Ca2+ = 3,100 mg/L, Sr2+ = 86 mg/L, NH4+ = 8.8 mg/L, K+ = 3,700 mg/L, and δ18O = +6‰ at δD = -33‰, which are similar to but slightly more diluted than the previous estimates by Masuda et al. (1985). In order to test the origin of the deep brine, a numerical model was developed to estimate the oxygen and hydrogen isotope compositions of the slab-derived fluid. The model considers the thermal structure along the subducting slab in a 2D across-arc section, stability and dehydration reaction of hydrous mineral phases, and the resultant partitioning of oxygen and hydrogen isotopes between the fluid and the residual mineral phases. First, the thermal structure of the subduction zone was calculated because dehydration from subducting slabs is controlled thermodynamically and hence chiefly by temperature and pressure. Since dehydration mainly occurs within hydrated oceanic crusts consisting of both sediment and AOC rather than the underlying oceanic mantle (e.g., Iwamori 2007), the temperature distribution along the surface of a slab is calculated as a function of subduction velocity (V), slab age (a), and subduction angle (θ), using an analytical expression based on that reported by England and Wilkins (2004). As a result, we estimated the thermal profile along the slab surface for the subducting Philippine Sea slab (V = 4 cm/year, a = 15 Ma, θ = 20°) beneath the southwestern Japan arc, as well as that for the Pacific slab (V = 10 cm/year, a = 120 Ma, θ = 30°) beneath the northeastern Japan arc. These thermal profiles, shown in Additional file 1: Figure S1, are similar to those obtained in 2D numerical simulation (e.g., approximately 600°C at 3 GPa; Iwamori 2007). Next, slab dehydration and the isotopic fractionation of oxygen and hydrogen were calculated, based on the phase relation of the subducted materials. Although oceanic sediments initially contain 10 to 30 wt% H2O (Plank and Langmuir 1998), most of water is liberated, decreasing to 2 to 4 wt% by extensive compaction and dehydration of minerals at depths shallower than 30 km (You et al. 1996; Hyndman and Peacock 2003; Kasahara 2003). The sedimentary column currently delivered to deep sea trenches is typically 50 to 500-m thick, and sediment 350-m-thick subducts from the Nankai Trough (Plank and Langmuir 1998). These values are 1/100 to 1/10 thinner than the AOC thickness, limiting its impact on the water budget in subduction zones. Considering these factors, although oceanic sediments still contain 1 to 2 wt% of H2O at depths greater than 100 km, the AOC-derived fluids are thought to be a major source that supplies deep-seated fluids to the overlying mantle wedge and the arc crust over the slab depth ranging from 30 to 100 km (Iwamori 2007), including the Arima area (Figure 1). Therefore, to simplify the model, we considered only dehydration of AOC and its phase relations for dehydration reaction (Schmidt and Poli 1998). It should be noted, however, that several key elements/isotopes such as carbon and lead, which are particularly concentrated in sediments, may have significant impacts on the fluid compositions (e.g., Sano and Marty 1995; Aizawa et al. 1999; Nakamura et al. 2008), as will be subsequently discussed. A model was then designed to estimate the isotopic characteristics of slab-derived fluids for the hydrogen and oxygen stable isotopic ratios that constitute the characteristic features of Arima-type brine. The major constituent minerals of AOC at the pressure-temperature condition beneath the Arima area (i.e., 1.5 to 2.4 GPa and 400°C to 500°C, including uncertainty in the estimates), where major dehydration of AOC occurs, are amphibole (22% to 48% in modal composition), lawsonite (22% to 36%), chlorite (0% to 13%), and epidote (9% to 22%; Schmidt and Poli 1998). Accordingly, the following water/mineral isotopic fractionation factors (α) for the major constituent minerals of AOC are used. where T is the absolute temperature. Epidote is one of the major constituent minerals in AOC at up to 22 wt% (Schmidt and Poli 1998) for the P-T range of interest up to 3 GPa and 600°C in this study, respectively. Matthews et al. (1983) reported that below 600°C, the oxygen exchange reaction is very slow between water and zoisite, the Fe-free end-member of epidote group minerals; therefore, no isotopic fractionation occurs. Instead, dissolution-precipitation appears to occur. In addition, the zoisite-water fractionation factor constrained by mineral-pair equations is around unity (Matthews et al. 1983), causing no 18O/16O fractionation. For these reasons, we ignored epidote in our estimates. The Rayleigh fractionation of oxygen and hydrogen isotopes was calculated by numerically integrating the following equation along the calculated P-T path for the Philippine Sea slab to obtain the compositional path in Figure 3: Δδf /1,000 = -(1-F)/F (αf/r - 1) × ln (1 - F) (Equation 7), where Δδf is the change in isotopic ratio of the fluid corresponding to the infinitesimal change in P-T (‰), F is the extent of dehydration reaction constrained from the phase diagram as a function of P-T (weight fraction), and αf/r is the isotopic fractionation coefficient between the fluid and the bulk rock calculated as ΣXi αi, where Xi represents the weight fraction of mineral i, and αi is the fractionation factor derived from Equation 1 to 6. The calculation starts with an average composition of AOC (δD = -40‰, δ18O = +8‰) obtained from a DSDP Hole 504B drill core >1,000-m long that includes fine-grained basalt to dolerite (Muehlenbachs 1986; Kawahata et al. 1987), as shown by the open star labeled ‘0 km’ in Figure 3. The δD value used (i.e., -40‰) is within the range reported from ODP/IODP Hole 1256D (-64‰ to -25‰, Shilobreeva et al. 2011). A shallow dehydration of this AOC produces relatively light oxygen isotopes (δ18O of approximately 0‰) and heavy hydrogen isotopes (δD of approximately -15‰) compared with those estimated in the Arima deep brine, which evolves toward the bottom right of the diagram. The results, showing larger δ18O and smaller δD values as the subduction progresses, reflect continuous dehydration and Rayleigh isotopic fractionation. The subducted young Shikoku Basin and its extinct spreading center (approximately 15 Ma; Okino et al. 1994; Sano et al. 2009) beneath the Arima area may share thermal and hydration conditions with a young oceanic crust at the 504B site off the Costa Rica Rift (approximately 6 Ma), partly justifying the assumed isotopic composition in Figure 3. Nevertheless, subducting slabs exhibit significant compositional variability, e.g., δD = -30‰ to -60‰, including sediment, AOC, and serpentinite (Kawahata et al. 1987; Giggenbach 1992; Matsuhisa 1992; Shaw et al. 2008), and causes significant uncertainty in the quantitative results of our model. As a consequence, the slab dehydration depth estimated for the Arima deep brine ranges from 45 to 70 km, as shown by the pink circle in Figure 3). Beneath the Arima area, the depth of the Philippine Sea slab surface is estimated to be 50 to 70 km with relatively large uncertainty (Figure 1; Nakajima and Hasegawa 2007; Hirose et al. 2008). Our numerical model suggests that the slab-derived fluid at such depth has an isotopic composition similar to that of geochemically estimated deep brine within the uncertainty, as shown in Figure 3. The estimated brine composition of δD at approximately -30‰ is similar to that estimated from analysis on back-arc basin basalts or melt inclusions from the Mariana subduction zone such as -25‰ (Poreda 1985) and -32‰ (Shaw et al. 2008), respectively, and the mass balance of subduction zone-scale material cycling at δD = -27‰ (Kazahaya 1997). The compositional range resembles magmatic fluids, although Arima is far from the volcanoes and is located in the forearc region in terms of northwestward subduction of the Philippine Sea Plate from the Nankai Trough. Westward subduction of the Pacific Plate causes magmatism in central Japan (e.g., Nakamura et al. 2008); Arima is located approximately 300 km west in the backarc region of the magmatism (Figure 1). The current understanding of the magma genesis, including the regional understanding along the entire Japan arcs (Iwamori 2007), indicates no magmatic production or supply beneath the Arima area. The 3He/4He ratio may provide crucial information of whether the observed geochemical features reflect the slab-derived fluid directly or if they are affected significantly by arc crust during ascent because the incorporation of crustal components significantly reduces the ratio. Figure 5a shows the 3He/4He ratios for the brine samples as well as the gas samples from the three gas-rich brines. Almost all of the sample plots within the two mixing curves including one between air-saturated water (ASW) and the upper mantle component (8 Ra) and the other between ASW and a component having 3He/4He ratios of 8 × 10-6 (5.7 Ra), indicating high contribution of the mantle component with minor crustal contamination (Figure 5a). Masuda et al. (1985) argued that the high 3He/4He ratios of the Arima hot spring brines are attributed to deep-lying magma and its interaction with the crustal rocks, together with diluted carbonated waters from the basement Paleozoic sedimentary rocks and the Cretaceous to Paleogene acidic igneous rocks that account for the overall δ18O-δD and solute variations of the Arima hot spring waters. Magmatic activity is certainly important for the origin of deep brines in some geothermal fields such as Salton Sea and Cerro Prieto with high Cl content and high 3He/4He ratios, where heat and material input (particularly gas in this case) from subaerial but mid-ocean ridge basalt (MORB)-type magmatism at depth interacts with the overlying thick sedimentary basin (Mazzini et al. 2011; Schmitt et al. 2013). Helium and carbon systematics of the sampled waters and gases. (a) 4He/20He versus 3He/4Ne diagram of the sampled waters and gases. Light blue diamonds represent samples from Arima; dark blue diamonds (TW-1 and TW-2) represent samples from Takarazuka. Red circles represent gas samples. Two mixing curves are drawn, one between air-saturated water (ASW) and the upper mantle component and the other between ASW and a component having 3He/4He ratio of 8 × 10-6, considering possible but slight crustal contamination. (b) δ13C versus CO2/3He diagram of the sampled waters. Yellow, pink, and purple boxes represent the three end-members of sediment-, limestone-, and mid-ocean ridge basalt (MORB)-derived carbon, respectively (Sano and Marty 1995). Solid curves represent mixing between MORB and limestone and MORB and sediment. Open gray box represents the compositional range for arc volcanic gases (Sano and Marty 1995). However, as discussed in the previous section, the Arima hot spring is different in that no magmatic activity is expected beneath the area and no thick sedimentary basin exists (Kozuki 1962). Since the absolute concentrations of 3He in AOC, oceanic sediment, and ASW are four to six orders of magnitude lower than those in MORB (Zelenski et al. 2012), the high 3He/4He ratios found in the Arima hot springs are attributed to mantle helium incorporated in the fluid upon its ascent in the mantle. Arima is located in an area with hot springs of relatively high 3He/4He ratios (greater than 2.5 Ra) known as the Kinki Spot (Sano and Wakita 1985; Figure 1). The Philippine Sea slab subducted beneath the Kinki Spot is young and hot because it is associated with the former spreading ridge (Sano et al. 2009), which may have enhanced the degassing of the mantle. The 3He/4He ratios are along the mixing line between the air and the mantle component, although the proportions of mixing differ from those identified from the solute concentrations (Figure 4). It is argued that shallow reservoirs exist beneath Arima (e.g., Masuda et al. 1985), where the meteoric water saturated with air mixes with both the deep brine and the exsolved gas and may cause variable mixing of the solutes and the gases. 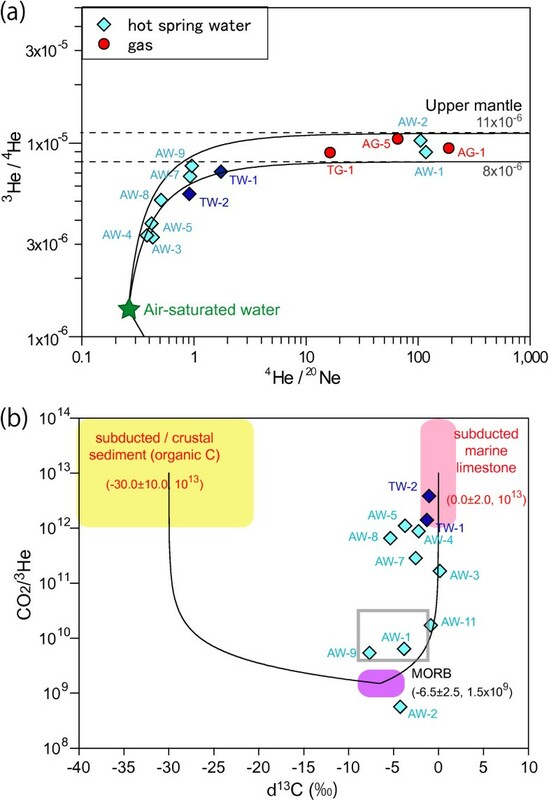 The broad negative correlation between the major solute elements and 3He/4He (Figure 2; Figure 5a) suggests that the spring waters diluted significantly by meteoric water in the shallow reservoir (e.g., AW-1, AW-2, and AW-9, Figures 2 and 3) have been fluxed by high 3He/4He gases (e.g., AG-1 and AG-5, Table 2 and Figure 5a) possibly derived from the deep brine (e.g., AW-3, AW-4, and AW-5) that ascends to the surface without being re-gassed. Carbon dioxide is one of the dominant volatiles in magmatic fluids and gases in subduction zones, which is also one of the distinguishing characteristics of Arima-type brine, and could have originated from slab fluids (Jarrard 2003; Fischer 2008). The plausible sources of carbon are (1) organic carbon in sediments, which are mainly in the continental crust although subducted oceanic sediments are reported to have similar values, (2) carbonate in subducted MORB (AOC), and (3) inorganic carbonate in subducted marine limestones (Nissenbaum et al. 1972; Marty and Jambon 1987; Sano and Marty 1995). In order to identify the origin of carbon, the correlation between δ13C and CO2/3He ratios is useful; in fact, hot spring gases in subduction zones can be explained by three-component mixing, as shown in Figure 5b (Sano and Marty 1995). Within this context, the observed carbon isotopic compositions of the Arima hot spring waters also suggest possible involvement of deep-seated slab materials such as subducted MORB and limestone rather than organic carbon from a shallow sedimentary reservoir (Figure 5b). The poor correlation between the major solute, mostly derived from subducted MORB, and the carbon isotopic ratios, mostly buffered by subducted limestone, may reflect decoupled processes of different lithologies in a subducted slab such as dehydration versus decarbonation. The CO2/3He ratios vary significantly over four orders of magnitude with broadly constant δ13C (Figure 5b). Low CO2/3He samples (AW-1, AW-2, and AW-9; Figure 5b) exhibited relatively high 3He/4He (Figure 5a) and low solute concentrations (Figure 4), when compared with the high CO2/3He samples (AW-3, AW-4, and AW-5) with low 3He/4He and high solute concentrations. Sano and Marty (1995) argued that the CO2/3He ratio of bubbling gas is lower than that of volcanic hydrothermal water which exsolves the gas because CO2 is much more soluble to water than He. They suggested that significant CO2/3He fractionation occurs during the ascent of deep hydrothermal fluids associated with decompressional degassing. Such a fractionation mechanism may consistently explain the lower CO2/3He samples (AW-1, AW-2, AW-9) that have been fluxed by the gas with low CO2/3He and high 3He/4He ratios in a meteoric water-dominated shallow reservoir, in addition to the high CO2/3He samples (AW-3, AW-4, AW-5) that contain more of the deep brine component from which the gas has been exsolved. It has been argued that a high concentration of Cl- indicates an extensive water-rock interaction either at depth of a high temperature or with the granitic basement rocks at a relatively shallow depth (Edmunds et al. 1985). In the latter case, Cl- is derived from granitic rocks by acid hydrolysis of biotite and plagioclase. Since hydrolysis of biotite could generate Cl-, Li+, K+, and other species in the groundwater, Cl- and Li+ can be considered as conservative products of biotite alteration. On the contrary, the acid hydrolysis of plagioclase may contribute to the principal sources of Na+ and Ca2+ in the groundwater without supplying Cl- or Li+. Molar Cl-/Li+ and Na+/Ca2+ ratios of the sampled waters, however, reach up to about 150 and 12, respectively, which are significantly larger than the stoichiometry deduced from the above reactions. Although the possibility of such an excess of Na+ and Cl- owing to decreases in Ca2+, K+, and Mg2+ through the formation of clay minerals in the aquifer cannot be entirely ruled out, it appears difficult to attain the high salinity (approximately 42,000 ppm Cl) solely by chemical interactions between the basement granites and water (Edmunds et al. 1985). The concentrations and isotopic ratios of Sr support binary mixing between diluted near-surface water (approximately represented by sample AW-2) and high-Sr deep brine (represented by AW-12; Figure 6). The estimated 87Sr/86Sr ratio of the deep brine is close to the estimated ratio of the Philippine Sea slab-derived fluid at 0.71087 and is distinct from the Pacific slab-derived fluid at 0.70538, possibly because the former has more terrigenous components subducted from the Nankai Trough (Plank and Langmuir 1998; Nakamura et al. 2008). The brine composition is also close to the lowermost range of the basement rocks including Rokko granite and the Arima group (approximately 0.707 to 0.710; Terakado and Nohda 1993). The interactions between the solutions and the basement rocks may have, to some extent, perturbed the 87Sr/86Sr ratios of the brine, which could have caused the poor correlation between the major solute concentrations (including Sr) and 87Sr/86Sr. However, the arguments above in terms of helium, carbon, and major solute stoichiometry suggest that the one end-member of the trend is likely to be deep brine originating from the subducted Philippine Sea slab, rather than the host country rocks. Analyzed Sr concentration expressed by 1/Sr (ppm -1 ) versus 87 Sr/ 86 Sr of the Arima-type brine. Sr concentration expressed by 1/Sr (ppm-1) versus 87Sr/86Sr of the Arima-type brine analyzed in this study, together with the data of the Rokko granitoids and the Arima group consisting mainly of rhyolitic welded tuffs (Terakado and Nohda 1993). Large red and green stars represent slab fluid compositions derived from the subducted Philippine Sea Plate and Pacific Plate, respectively (Nakamura and Iwamori 2009). The analytical errors of 87Sr/86Sr ratio in this study are approximately 3 × 10-6. Numerical forward modeling in this study suggests that slab fluids with δ18O-δD values similar to the Arima-type brine are produced along the subducted Pacific slab beneath the northeastern Japan arc (Figure 3). However, the produced fluid reacts with the mantle wedge just above the slab to form serpentinite due to the cold geotherm along the slab (Iwamori 2007). Therefore, the fluid is absorbed by the mantle and subducted to the deeper part along the slab, which may explain the absence of the Arima-type brine, to our knowledge, in the non-volcanic forearc region of northeastern Japan arc. On the contrary, in a warmer environment beneath the southwestern Japan arc, such an ‘absorption’ effect by serpentinite is greatly reduced (Iwamori 2007), and the slab fluid may escape to the surface without significant reaction with the country rocks, possibly guided by large faults at crustal levels. It is also noted that the amount of fluid generated from the slab is maximum at depths of 30 to 80 km and is greatly reduced deeper than 100 km in most subduction zones (Iwamori 1998). Instead, beneath the northeastern Japan arc, the subducted serpentinite along the slab undergoes dehydration and supplies fluids upward beneath the arc volcanic zones, causing melting in a high-temperature region of the central part of the mantle wedge (Iwamori 1998). Then, hydrous magma is fed to a shallow chamber, where degassing may create volcanic waters and gases. Therefore, δ18O-δD compositions of the volcanic thermal waters, widely known as ‘andesitic water’ having δ18O = +5‰ to +10‰ and δD = -10‰ to -30‰ (Taran et al. 1989; Giggenbach 1992), integrate and reflect these processes of slab dehydration, sepentinite formation-dehydration, reaction with the mantle to cause melting, and degassing, as discussed by Matsuhisa (1992). In this context, andesitic water and the Arima-type brine as suggested in this study are believed to reflect different origins, although their δ18O-δD ranges overlap. 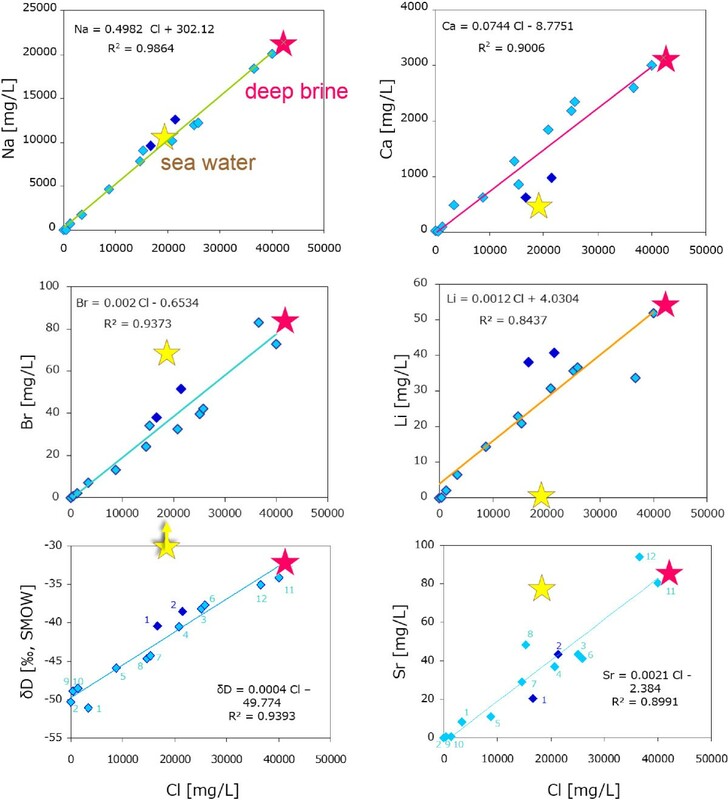 The estimated solute concentrations in the Arima deep brine (e.g., 42,000 ppm Cl; 3,700 ppm K; 84 ppm Br; Br/Cl ~ 2.0 × 10-3) are consistent with the recent knowledge on slab-derived fluids, e.g., 12,000 to 240,000 ppm Cl, 600 to 3,700 ppm for K, Br/Cl ~ 1.0 to 3.7 × 10-3 for fluids derived from subducted serpentinite (Kendrick et al. 2011), and 5.1 wt% NaCl (approximately 30,000 ppm Cl) for fluid inclusions in the mantle xenoliths (Kawamoto et al. 2013). 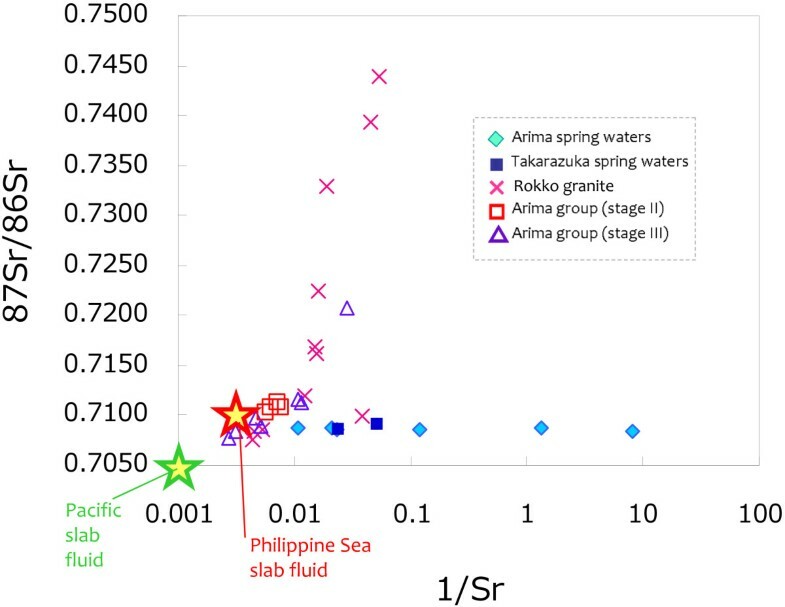 On the contrary, the Philippine Sea slab-derived fluid compositions estimated from volcanic rocks in central Japan (Nakamura and Iwamori 2013) have higher concentrations for K and Sr (64,000 and 268 ppm, respectively), possibly reflecting different dehydration conditions of higher pressure and temperature beneath the volcanic region compared with those in the forearc region in southwestern Japan (Nakamura et al. 2014). It is also noted that during deep processes of dehydration and melting in subduction zones, Cl and F are reported to behave very differently (Straub and Layne 2003), which may explain the poor correlation between the major solute including Cl and F (Figure 2). In any case, the composition of the Arima brine appears to retain the deep fluid signatures derived from multiple sources such as the subducted Philippine Sea slab and the overlying mantle, including (i) AOC for most water and hence hydrogen and oxygen isotopes in addition to associated elements such as Cl, Na, Li, Br, Ca, and Sr (Figure 2), (ii) subducted sediment, particularly limestone, for carbon, and (iii) mantle wedge for a high 3He/4He component. These signatures indicate that deep-seated fluid may reach the surface without significant interaction during its ascent, such as through channel flow from depth, as also suggested from the seismic velocity variations (Iwamori and Nakakuki 2013) and trace element transport in subduction zones (Ikemoto and Iwamori 2014). However, only a small amount of contamination by the basement granitic rocks with very high 87Sr/86Sr may have affected the Sr isotopic ratio of the fluid, and some crustal helium with low 3He/4He could have affected the degassed water samples such as AW-3, AW-4, and AW-5 with relatively low He content (Table 2). If such a fracture system is a dominant mode of fluid transport, the Arima-type brine may put direct constraints on both the compositions and processes of slab fluid at depth. The authors would like to thank HA Takahashi, M Takahashi, M Tanimizu, and T Ishikawa for their help in elemental and isotopic analyses, M Totani for his kind arrangement and assistance in sampling hot spring waters in the Arima area, and the two anonymous referees for constructive review that greatly improved the manuscript. CK, HI, HN and KK designed the study, CK and HI sampled the waters and gases, CK and NM carried out the elemental and isotopic analyses, CK and HI constructed and performed numerical modeling, all authors discussed the data to make interpretation, wrote the text, prepared the figures and tables, and read and approved the final manuscript.